At the very least when installing a bus video system it would be great to not destroy the mechanical structure, or the appearance of the bus. 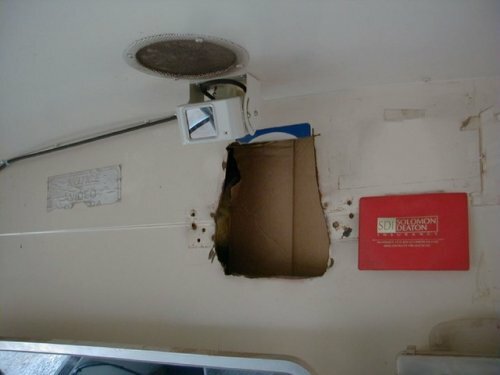 This crater in the bulkhead was where the installer decided to recess the “Jack-in-the-box” into the bulkhead so they would not stick out so much into the bus walkway. Now after the older system is removed, it not only left a big ugly hole, but a lot of very sharp edges. This should be covered up with a flat metal panel to prevent injury to children who may handle the edges.